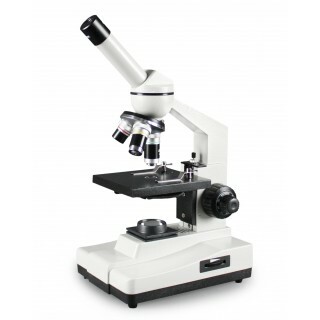 This compound microscope is ideal for elementary to high school instruction. Cool-to-touch, long-lasting LED Illumination is equipped with intensity control. Ball-bearing objective turret is mounted, allowing for smooth alignment while positive click stops ensure instant and precise magnification. The (Widefield) WF 10x and WF 20x eyepieces are interchangeable, allowing for increased magnification from 40x to 800x. DIN achromatic objectives are parfocaled and parcentered, providing sharp, color-corrected images. Coaxial course and fine focusing knobs are positioned low on the bracket near the base, making certain that adjustments are made with maximum stability and minimum strain. The rechargeable battery enhances flexibility, adding a cordless feature, which guarantees easy transport and increased mobility. Rugged cast aluminum with gray enamel finish. 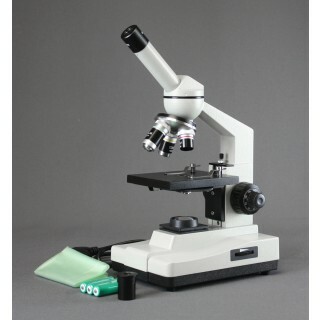 Packed in a fitted styrofoam box; includes a dust cover & an instruction manual. 5-year limited warranty excluding bulbs.